Remove the cover from the box. Place the canopy fabric bundle on top of the frame and unroll the canopy down the center of the frame. When completely unrolled, unfold the cover across the canopy bows and pull down snugly over the frame. Make sure the canopy is straight on the frame with equal amounts of overhang on each side. The QuickLash black webbing should be on the inside right behind or slightly above the aluminum canopy frame going lengthwise and across the ends. You can find out more about the QuickLash system here. The Hewitt uses the bungee ball system for the sides and bungee hooks on the ends. Take the bungee loop and insert it through the perforated holes on the QuikLash webbing directly corresponding with a canopy frame rib. 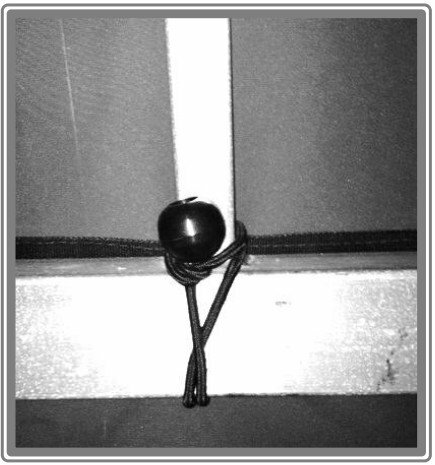 (fig A & B) Next run the loop under the frame, up and around the rib and tuck the ball underneath the bungee cord, tension will hold the ball in place. ( Fig. A )You should alternate from one side of the canopy to the other to avoid off centering the canopy. Attach the bungee hooks to the QuikLash webbing on the ends. (fig. 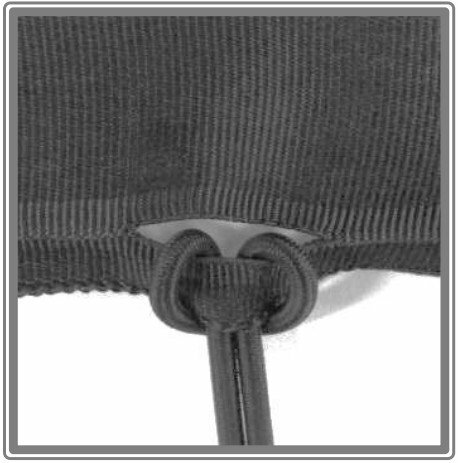 B) Stretch the bungee and insert the hook into the hole in the frame or the welded washer on each rib. Removal: Simply unhook the bungee balls from the ribs and unhook hooks from washers on the ends. It is not necessary to remove the bungees from the canopy cover. The bungees can remain looped through the quiklash webbing and ready for next seasons installation. Storage: Make sure your canopy cover is DRY and clean prior to off season storage. Store in a clean and dry environment.